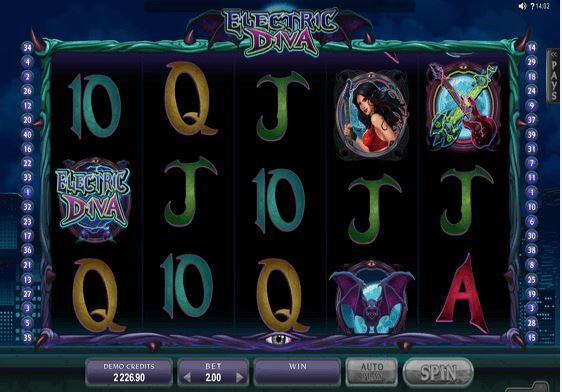 Electric Diva Online Video Slot Powered by Microgaming has 40 paylines on 5×3 reels. The Wild symbol in the game is the game logo, while the Scatter symbol consists of two Guitar Blasters. There’s also a Bonus symbol – one of the invading aliens – and if you get three or more of those on your reels, you’re off to the bonus feature! In the bonus game you will be face-to-face with the aliens: there are 18 of them in total, waiting for your first move. Pick which one of the alien hovercrafts is going to get a taste of the Guitar Blaster first, and carry on going until you come across the Start Free Spins symbol after the smoke of the explosion clears… You can win up to 40 Free Spins with 8x Multiplier.